Joseph and I left Salem around noon. We went to Kennebunkport to visit Bonnie, one of Joseph’s clients. Their summer home is a cottage where all the rooms face the water – beautiful and peaceful. It was a short but very nice visit. We left for Portland around 3:30, with an intention of getting there before five and going to Cross jewelers, but we didn’t make. Cross had just closed when we got to Portland, so we just checked into the Westin. The room wasn’t clean…the toilet look like someone with diarrhea had used it – maybe a customer, maybe not. It was yucky and annoying. Joseph and I went to the front desk and asked to be moved…and we were…but the whole thing took almost an hour. By then it was almost sunset, so we went to the rooftop to watch it. Joseph had a beer and I had hard cider, and we split an appetizer. Sunset was OK, but there were too many clouds to make it fabulous. However, I was curiously watching the two couples at the table next to us. I wondered if they were friends or if either the guys or the girls were business colleagues with trailing spouses. It seemed like the guys were trying to prove themselves to each other. One of the women seemed like she was trying to figure out what was going on with them. By the time the sun had set, we were ready for dinner. I found a place that got good reviews and it was just a couple blocks away…we could walk it easily. On our way, in the town park next to the Westin, a salsa band was playing and people were dancing. It was such a fun time – some people were salsa dancing while others were just grooving to the music, with or without someone. I loved it…Friday in Portland…Perfect! Afterward we walked down High Street to The Little Tap Room, a place that had so many good reviews online. When we got there, we found the cute corner bar, a beer and burger joint. It was too hot to sit outside, so we waited for an inside table. Joseph and I had one drink and, before getting a second one, ordered a burger and a poutine. The server warned us that the burger would take forty-five minutes. Really??? We weren’t in a hurry – after all, it’s vacation. And I appreciated the heads-up. So we told the server to bring us the poutine. We’d share it and then share the burger. While we waited for the poutine, someone brought is two little spoons with a cucumber something on it…a taste, nothing more. I guess it was in place of table bread or popcorn. The poutine arrived and it was good. And maybe we should have stopped there. As we finished the poutine, our burger came. I cut it in half. It was very rare and neither of us could eat it. But before we could get the server, he came to us. He’d brought us somebody else’s burger. Ours still wasn’t ready. He took the other customer’s burger away. I wondered if he was going to bring it to the rightful owner – the one I touched. Ewwwww. We waited. When it finally came, it was still pink inside. But we waited so long that we just picked out the pink part. We couldn’t wait to get the check and get out of there! The walk back was happy. Portland lights at night were pretty…pretty enough to go back to the Westin rooftop and watch them. I didn’t want another drink, I just wanted a cup of tea. I got it, but without cream or sugar. When those finally came, the tea had cooled and the cream curdled when I poured. By then all I wanted was to go to my room, take off my bra, and watch some mindless TV. High Street to the harbor and Becky’s Diner. It was a long wait. We got to meet a couple from St. Paul MN. They’d flown into Boston and rented a car to get to Portland. They thought about going to Acadia, but it was too long a drive for the amount of time they had. I suggested they go to Rockport on their way back. Becky’s is a real down-home kind of place with decent prices. I had some really good corned beef hash and eggs and Joseph had an omelet and fabulous blueberry muffin. We walked the steep hill back to the hotel. It might not have been as hard if it wasn’t so hot and humid. But we did it. Back at the hotel, we showered and checked out. 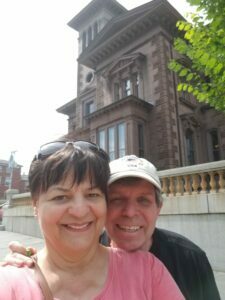 Then we decided to go to the historic Victoria House. It was nice, but it’s being renovated and, while it’s old, it has no real historic significance. I’m not sorry we went there, but it’s not one of those “must see” places. Finally….we left Portland for the cottage at Town Hill. Yayyyyyy!!! !